They were all lined up and under it. If they’d have slowed the boat down as it dropped in or cut the chute loose while it was gliding above they’d have caught it no problem. Seems like they must think they’ve got it pretty darn close and confident they can close the gap using operational missions and this is why they have set out for the East coast. Will be fun to see ‘em catch the first one! Hard to tell but looked like the nose of that fairing cracked off during the drop from just above net-height. So as I've been worried before once the weight is off the parafoil and onto the net the parafoil will fall back into a high drag position and tend to pull the fairing backward. But also as I previously said that effect can be mitigated if they have a parafoil release mechanism which as we just saw they do. So that failure mechanism that I was concerned about has been addressed. As for it being too far back in the net, I think that was obvious to any of us that saw it in side view but maybe not so much from the viewpoint of the pilothouse on the ship. So maybe they need to have a video drone beside the ship (too far out to sea for a helicopter) and make ship speed decisions from that viewpoint. I mean they obviously had a drone or something similar side view to use for this, since that's what they gave us in the video where it didn't work well. Camera on the deck looking straight up should be just fine, and probably better than a drone that someone has to pay attention with about field of view, where it's pointing, etc. If you want to get fancy, download OpenCV and compute optical flow, which would give you a vector of direction change in addition to the imagery. The camera shot they showed was a bad angle for estimating where and how the terminal catch phase is going. Even the side angle, you really had to pay attention to check deltas. The straight up shot gives you exactly where it's landing in both dimensions in one view. AAAh dang, so close, so close ! The freakkin' thing touched the recovery net, for a brief moment, hesitated a bit, and then committed suicide, diving into the sea. So close ! Next time will be better. Perhaps one of the issues is wind shear or wind gradient. If you assume that there is wind and the parafoil is gliding into wind and the boat is travelling into wind then one would expect that if the boat is maintaining a constant speed then airspeed would drop towards the end. You might think that would increase the speed of the parafoil relative to the ship but it might become close to the stall and increase drag dramatically which could be a greater effect. This thought is coming from some fixed wing gliding experience where one deliberately has a steeper and hence faster approach on landing to avoid a stall since one tries to land into wind and most of the time a glider flies at a best glide speed which is not much more than minimum sink which is not much faster than a stall. As one descends through the wind gradient airspeed drops. I'd been interested to hear from a parafoil expert. Edit: there is also curl over / wind shadow from the boat to consider. Maybe it is necessary to drop the fairing closer to the wheelhouse, which could be alarming. I still think the ship needs to be under control from an automated system with feedback from the fairing's position and predicted location. The course of the ship in the most recent video looked like it was human control with that late big move to position the ship. I think they are close and will get it sorted soon. According to a Redditor (nginere) who says he designed the avionics for the parafoil guidance, Mr Steven is under automated control during the catch attempts. If you click on his username on Reddit, you can read his other post(s) on the subject. Link to the Reddit post is embedded in the NSF post below. Excellent, thanks for the information. Perhaps they are still tuning it. I haven't read all 96 pages of this thread, so not sure if this point had been made before. While this is a very cool and novel approach, I'm wondering if it'd be more successful oif they went with a Mid Air Recovery method that LM envisioned for their Atlas partially reusable concept. 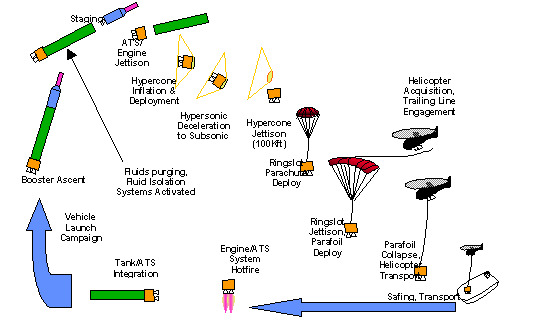 Basically a similar concept with a parafoil, but it had a long drogue above it that a helicopter could hook and then lower the Atlas RD-180 engine down to the deck of a ship. That may be easier and more flexible to do than trying to get a ship under it with a big net. A helicopter can intercept much higher and have a much longer time to try for a successful capture. The ship basically just one shot at it. Need a pair of helicopters and a ship with a deck large enough for them to take off and land from. Nowadays there's even unmanned drone options that could be considered if they wanted to reduce the risk to pilots in poor weather of capturing a fairing half and landing on a pitching ship deck. Or...just upgrade their PLF's halves to withstand a dunk in the ocean for a couple of hours and still be reused fully. Then just use a boat to recover them. Lobo: This suggestion periodically comes up. Read the prior thread for lots of discussion of it, and of why the approach SpaceX took is likely to be a lot lower cost and more reliable. Yes, all 96 pages, because it's not a new topic. Any word on an attempt for fairing recovery with the Arabsat launch, and other upcoming east coast launches? Mr. Steven has departed port also, the entire fleet is on deck for this FH mission! So what can Mr Steven do without arms and a net? Something with the big, round, raft? This may have nothing to do with fairing recovery. Mr Steven can run down and recover fairing halves landed softly in water. The fairings have been waterproofed and can be picked out of the water and be reused. Is there a source for this information? The NSF community has talked about it, but I'm unaware of SpaceX doing such work. Edit: I agree they are likley fishing these out of the water. Mr Steven needs arms for fairing halves fish out from the water, he doesn't have any other crane. GO Searcher and GO Navigator will do that this time probably. Each of them can carry one fairing half. Does this imply that fairing catching has been abandoned as too much trouble for little gain? Teslarati has been reporting that Mr Steven lost a couple arms a while back, which could mean that they are just going with what they have until they can get the net-boat operational again. I think they jury is still out on which will be used in the long term -- water recovery or net catching.